The Taoiseach and Tanaiste are being acclaimed on all sides for winning the battle of Brexit, so my criticism of how they conducted the campaign won't bother them. They are boosted by a poll that implies we are not that bothered by what happened to Maurice McCabe, but that we like Fine Gael beating up on Brits and unionists. Me, I don't think the Taoiseach should be rewarded for standing by Frances Fitzgerald and feeding our tribal instincts instead of reminding our people that Arlene Foster was acting rationally in looking after her increasingly isolated people. Like two gung-ho American generals, Leo Varadkar and Simon Coveney set out to win the Brexit battle without regard to collateral damage they might cause to relations between the Republic and Northern Protestants, and not just the DUP. Last Friday, both men tried to stick some thin bandages on the wounds. But the damage done in three main areas will be difficult to undo. First, Fine Gael has been dog-whistling about a united Ireland in a determined way for some time now as part of its Brexit campaign. Second, this rhetoric has transferred itself to a terrifying sectarian surge on social media in the Republic. Finally, this Fine Gael flag-waving nationalist fever benefits only one party on this island - Sinn Fein. Looking back it could have been done differently. I have no doubt whatsoever that if Charlie Flanagan was in Foreign Affairs that Arlene Foster would have been far more amenable to what was afoot last Monday. Simon Coveney did not just spook the DUP by going gung-ho on Morning Ireland last Monday. He had been spooking most unionists for the past six months. Coveney began to wave the green flag as soon as he took over foreign affairs. Until then relations between Dublin and the DUP were relatively good, despite Sinn Fein's best efforts to edge between. Arlene Foster visited a Roman Catholic school, spoke Irish and warmly supported a soft Brexit in a visit to Dublin. But it all changed for the worse on June 14 when Coveney took over. He started by supporting Sinn Fein's demand for an Irish Language Act, got confused about "special status" and tinkered with a technological border in the Irish Sea. Only a month later, the normally phlegmatic Nigel Dodds exploded in exasperation to say that since Flanagan was moved from Foreign Affairs, "confusion seems to be the order of the day". The answer, then as now, is that Leo Varadkar is a willing prisoner of Simon Coveney's Northern policy. For practical purposes, Coveney's policy is so entangled with that of Sinn Fein that not even moderate unionists can separate them. In a recent interview, when asked about Sinn Fein's dark hinterland, Coveney said he favoured "moving on", an amnesia craved by Sinn Fein. More recently, he put aside the pluralist decencies of the past 20 years and told an Oireachtas Committee he favoured a United Ireland in "his political lifetime". Like the rest of unionism, the DUP duly took note and decided not to give him an inch. But the Taoiseach backed him up last Tuesday by doing some loud dog- whistling of his own. Leaders' questions that day consisted mostly of a post-mortem on the stalled talks. Micheal Martin made a supportive speech, citing the common interests of unionism and nationalism. Like a real republican, he stressed the importance of reaching out to unionists and asked the Taoiseach to join with him in criticising those parties who had failed to take their seats. The Taoiseach's creepy reply was a mixture of anti-DUP dog-whistling and gligeen glibness. He first insinuated that Martin had not mentioned Northern nationalists - which Martin had. He then went on to start what would become his familiar mantra - that the DUP was only one party in Northern Ireland. This is either stupidity or a super dog-whistle. Only two parties now really matter in Northern Ireland - the Democratic Unionist Party and Sinn Fein. On Brexit, the DUP represents a minority against the majority. But on the matter of being bullied by Dublin, the DUP represents the vast majority of unionists as comments from David Trimble and Reg Empey made clear. The Taoiseach's dog- whistling went down well with most of the print and broadcast media. But, as could be predicted, it summoned a pack of rabid dogs on social media where Sinn Fein trolls peddled foul slurs at Foster. The Taoiseach is of mixed ethnicity. He of all people should be sensitive to the primitive nationalist passions that lurk in the body politic in every country. But while the tribal trolls on social media sated themselves with vile misogynistic jibes at Arlene Foster, the Fine Gael bourgeoisie needed more sophisticated fare. Simon Coveney, since he re-tweeted it, seemed to think he had found the Holy Grail in Noel Whelan's Irish Times article titled 'It is not an act of aggression to want a United Ireland'. Actually, I can't think of anything more aggressive to Northern Protestants given the wounds inflicted by the Provisional IRA in pursuit of the same demand. Incredibly, the Taoiseach brazenly endorsed Coveney's united Ireland guff in last Friday's interview with Sharon Ni Bheolain. But there are other flaws in the case Whelan makes for unity as a 'constitutional imperative'. Far from pushing unity, the Good Friday Agreement gives the Republic a formal veto over precipitate constitutional change in the North. Thank God. In passing I note the phrase 'constitutional imperative' was lifted from the West German Basic Law of 1949. Presumably from the perspective of the Four Courts, Northern Ireland was East Germany, and partition was a Stalinist mutilation. Looking back over last week, I am grateful the Taoiseach and Tanaiste seem to have staved off a hard border. But I fear the Catholic Hibernianism of their new ultra-nationalist "united Ireland" Fine Gael. That was why it was consoling to find a few brave souls sounding warnings last week about the rise in tribal rhetoric. 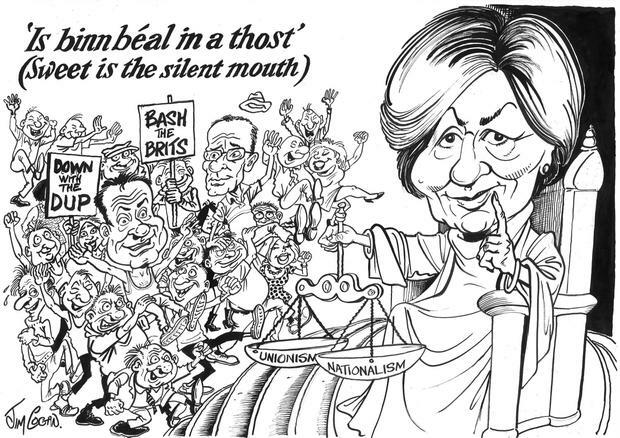 Led by Olivia O'Leary, Stephen Collins, Dan O'Brien and Eamon Dunphy, reminded politicians of the old Irish adage, "sweet is the silent mouth". Among the politicians, Stephen Donnelly and Eamon Ryan urged less green rhetoric and more reaching out to Northern Protestants. They had little chance of a sympathetic hearing when an Irish Taoiseach seemed happy to be making the same noises as Sinn Fein. Thank God for Micheal Martin. Like Jack Lynch, he takes seriously the old title 'Fianna Fail - the Republican Party' and the Wolfe Tone tradition of reaching out to Protestants and dissenters - like the members of the DUP.